The New Balance Rubix v1 combines exceptional support with a light step, utilizing key design features to get the best of both traditionally opposed fields. 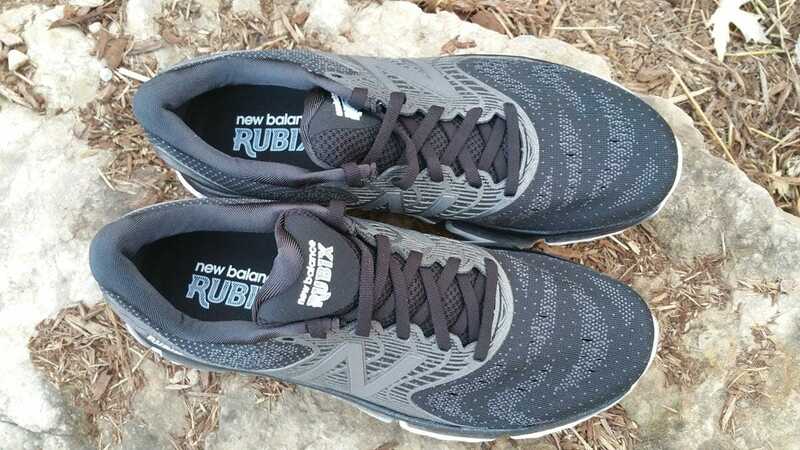 If you yearn for a lightweight stability shoe (not light-stability) - that maintains a stiff midfoot, secure upper, and a solid base throughout footplant, Rubix breaks into the market as your go-to for speed through endurance runs. Those who prefer an even lighter shoe for fast efforts but want more beef underfoot for long runs, will find this in Rubix. The name evokes the intrigue (and frustration) of attempting to align the colors of a Rubik’s cube—sounds like trying to find the right running shoe after a brand changes the line we love, am I right? New Balance comes through on this breakout model! Rubix combines the worlds I run in: solid–but not so heavy, (relatively) light–but not sacrificing cushion or upper strength. Length fits true-to-size; it’s on the narrow end of medium-width. The hint of sparkle tracing this sole immediately made me smile. There are holes in this shoe, I mean literally. 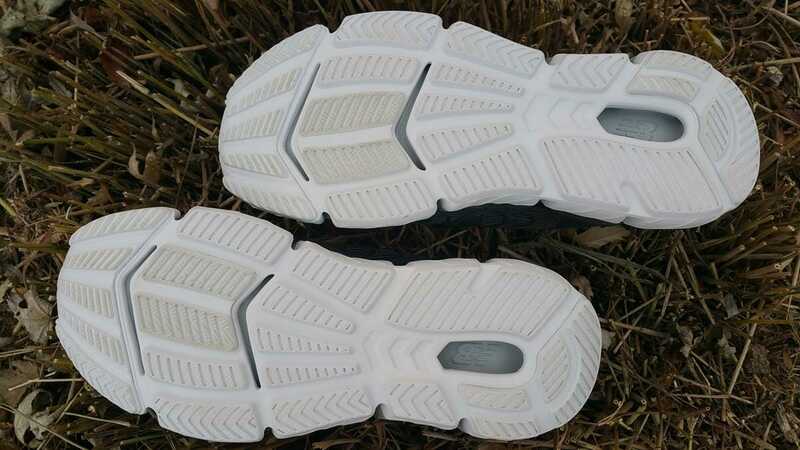 In pictures, I saw the midsole spaces: would it hold solid midfoot or be another “mostly stable” accommodation to weight reduction? Result: It holds strong! Yet it bends nicely at the ball of the foot for a flexible feel. Walking around in Rubix in the low-light calm of putting my kids to bed, my first thought went to the forefoot cushion’s similarity to Brooks’ PureCadence. PureCadence drops from heel to toe at a 4mm differential; Rubix is an 8mm offset. Rubix’s shallow toe box and secure fit throughout are similar to PureCadence 6; Rubix has a sole that’s 5-10mm wider, depending on the spot. When I laced up for my first run, I saw the colors of my socks breaking through the upper. Hmm, that’s great for breathability, and the structure it provides holds my foot in place (another win for me; however). If you’re one who wears holes in the top of your shoe, this thin upper will not hold up for very long, unless your big toe falls within the first centimeter of the tip. There is a strong plastic rim inside the toebox upper that curves back, to help with this issue. Brooks Transcend also comes to mind when running in Rubix. The uppers are both secure and on the medium-narrow end: Rubix has the slight, slight give to the medial forefoot that I longed for in Transcend. Both bring a stable platform with 8mm offset. Transcend rocks you forward, while Rubix brings the benefit of a 6mm wider forefoot sole unit, 8mm wider heel (same width midfoot). And yes, you’re right, they do look like HOKAS! Rubix has a firmer-soft, responsive midsole like Arahi as opposed to Clifton or Bondi. Rubix is on the heavier side of a “light” shoe (.8 oz. more than Arahi) but don’t feel heavy—definitely light for a stability shoe of this caliber. Like Arahi, Rubix has durable patches on the outsole, placed strategically in high-impact zones, while the rest is softer (lighter) foam (Rubix’s just isn’t a different color). The biggest difference in placement is that Arahi places firm rubber on the medial forefoot while Rubix keeps it more centered; both reinforce the lateral heel for durability. Arahi is slightly wider in the heel, Rubix the same, in the forefoot. The arch support is further back in the shoe than normal. This is perfect for my overpronation issue because loose foot ligaments cause my feet to collapse inward precisely at that early midfoot point, which then causes other problems. The arch height is medium-low. 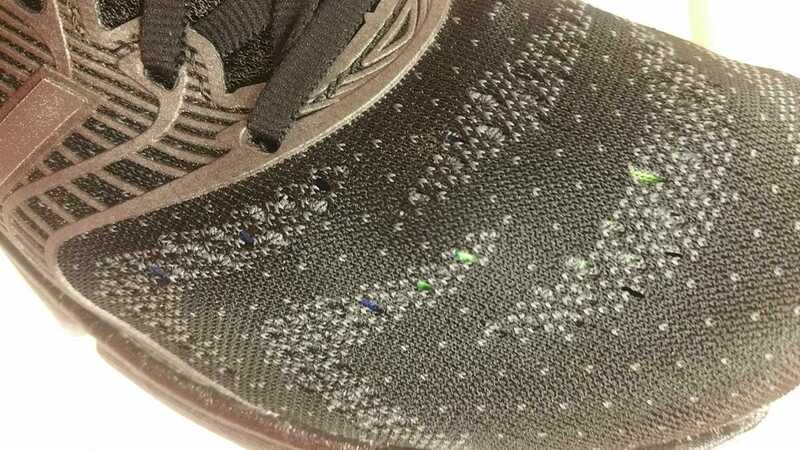 This unique sole unit was designed using data collected from pressure points during runners’ steps. New Balance used this aid from technology to create what they call their “guidance ramp” design. There’s a layer of soft foam on top of a layer of firm foam that is thicker along the medial and lateral edges, to encourage neutral foot motion. High-abrasion areas are covered in durable rubber. 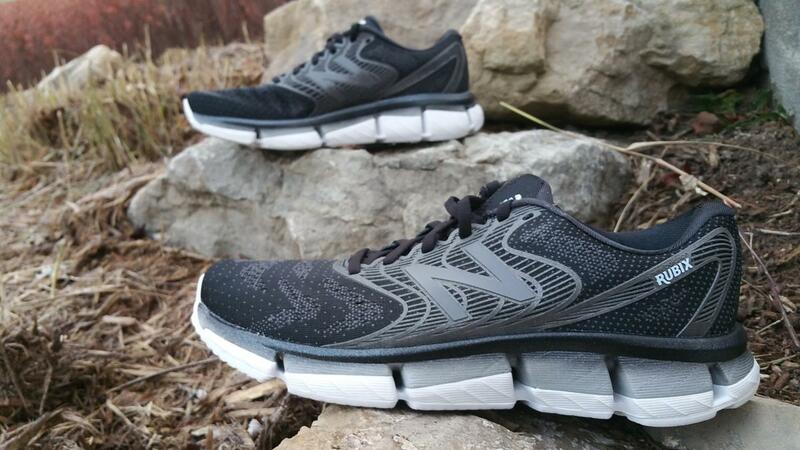 Engineered jacquard mesh and TPU fine mold provide surprising structure for such a thin, breathable upper. There’s a firm cap on the toe that extends back 1 cm; just be aware that past this point the upper won’t resist a lot of wear. 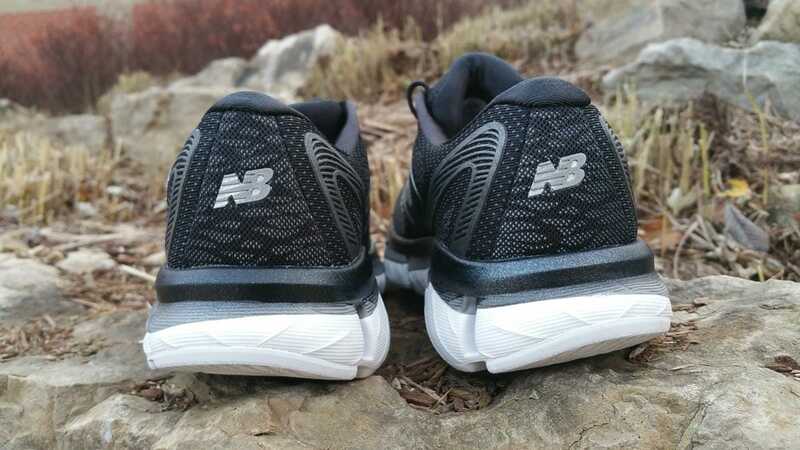 Rubber overlays including the “N” logo add support to the midfoot, but it noticeably curves away from the medial forefoot—right where I need a touch of flexibility to keep my foot from rubbing. The tongue is secured on both sides by an inner “saddle,” very similar to Saucony’s ISO series design, somewhat like Nike’s tongue in Odyssey React (but this is more of an internal bootie throughout). Moving back we encounter a decent heel mold to counter excess movement, padded with soft cushion around the top 2/3 of the ankle opening, for comfort and heel-lock. There’s a layer of soft foam on top of a layer of firm foam that is thicker along the medial and lateral edges, to encourage neutral foot motion—it feels like it works; it’s a stable ride. 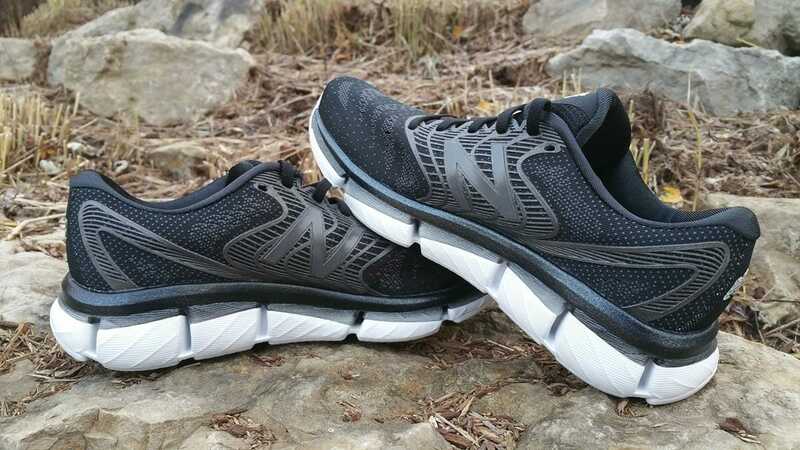 Another reason I love this shoe—in addition to the sturdy, light ride—is that the forefoot cushion holds up into double-digit runs. High-abrasion areas are covered in durable rubber. This shoe is very supportive; the wide sole and arch support are outstanding. Though the arch is not spectacularly noticeable, its position causes the stars to align—or, at least, the bones in my foot. Combine this with a secure upper all around and strategic spaces throughout the shoe, and we have a high-stability shoe for the price (weight) of low (stability). Adizero Tempo 9 remains my favorite marathon racer, and PureCadence 6, my 5K, but Rubix has earned its spot as a go-to for tempo, long and recovery runs. Rubix’s low-medium weight places it alongside ASICS GT-1000 and UA’s Europa; the higher price may be worth it for the increase in cushioned support. If you try out this new model (so fun; innovative designs must be explored), let us know your take-away in the comments! We purchased a pair of New Balance Rubix v1 from runningwarehouse using our own money. This did not influence the outcome of this review, written after running more than 50 miles in them. Is there a break-in period for these? I did run in them right away and didn’t feel much of a break-in period. The cushion is more firm than some HOKAs and adidas Boost, but my feet did not get sore running in them. It’s responsive, but still protects/cushions. The shoe was flexible at the forefoot from the beginning, too, without much break-in. I’ve had to return them. I love the uppers and the support but after running in Hoka shoes a lot recently, these were just too firm for me to be able to use. You might like Saucony Hurricane ISO, then. They’re very cushy underfoot and have good support in the upper. Very good is an understatement…these shoes im absolutely blown away…first to the comments above…they are very firm…im big so im 6’4 260 lbs…i have run a 5k but no distance…i run 5-10 miles a week and these are amazing…they are almost the same concept as the original mizuno paradox…they are somewhat light…and when walking are firm but not too firm…and i feel the corrective position of the shoe…my only gripe…brighter colors lol. New Balance kept the Rubix’s upper simple. It features a full-length jacquard mesh material that’s woven closer in areas where more structure is necessary and further apart where more breathability or stretchiness is required. 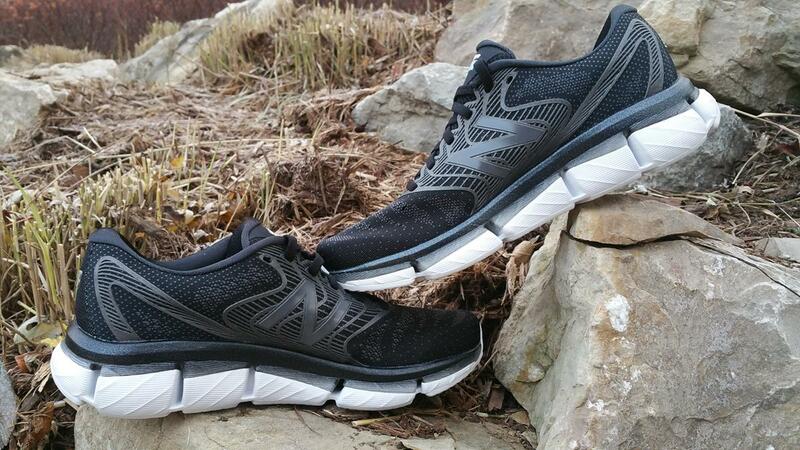 In the midfoot, you’ll notice some TPU overlays for additional structure and support.